As the name implies, Red Rock Canyon is filled with impressive colorful sandstone. The red rocks stand out from their lush green surroundings to create a dramatic landscape. 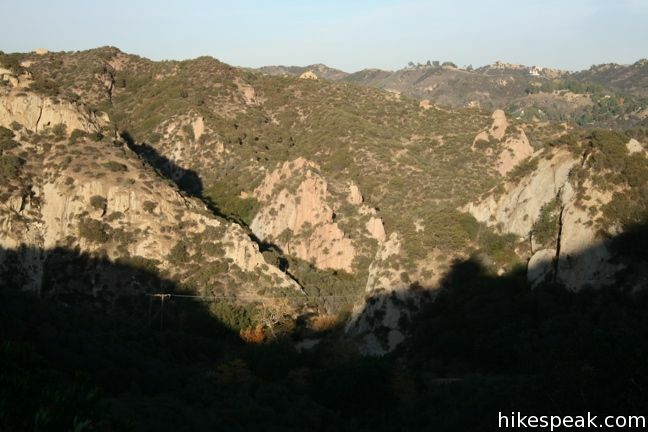 The canyon lies adjacent to Calabasas Peak, which can be visited in conjunction with the park to form an excellent excursion. The park’s main entrance is located at the end of Red Rock Road. Main is in quotes because the park entrance is so hidden that one must drive down a narrow dirt road to reach it. First time visitors will be questioning their directions, but this only adds to the enchanting character of the park. 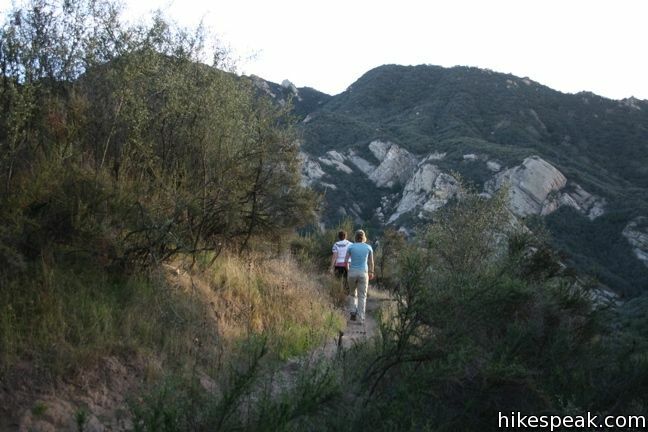 The other way to enter the park is by hiking in from Stunt Road along the Calabasas Peak Motorway. This adds some extra mileage but eludes a $5 parking fee. 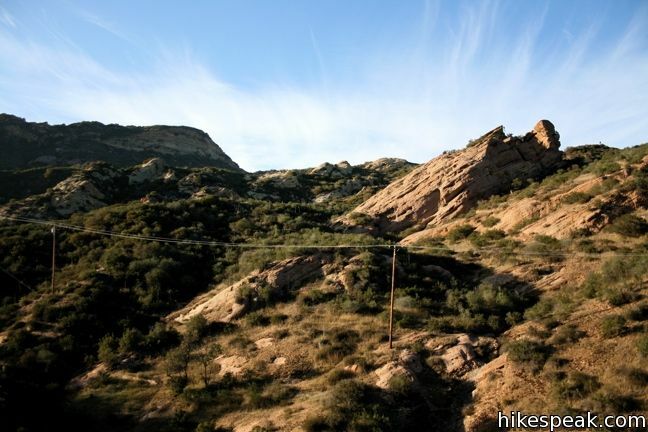 The park has two main trails, Red Rocks Overlook and Red Rock Motorway. 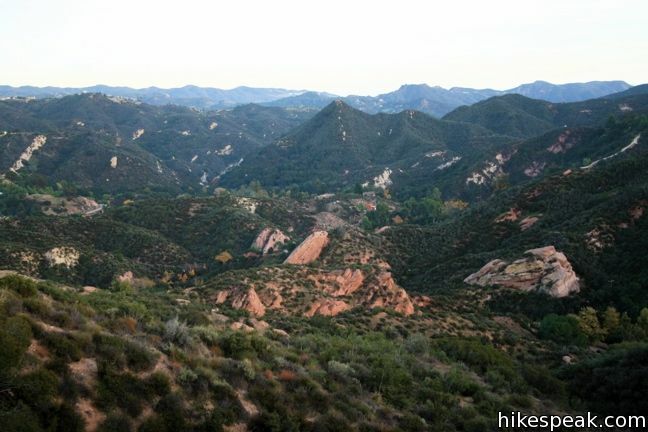 Red Rock Motorway is a 1.2-mile long wide fire road that starts at the parking lot and progresses up to a T-junction with the Calabasas Peak Motorway. 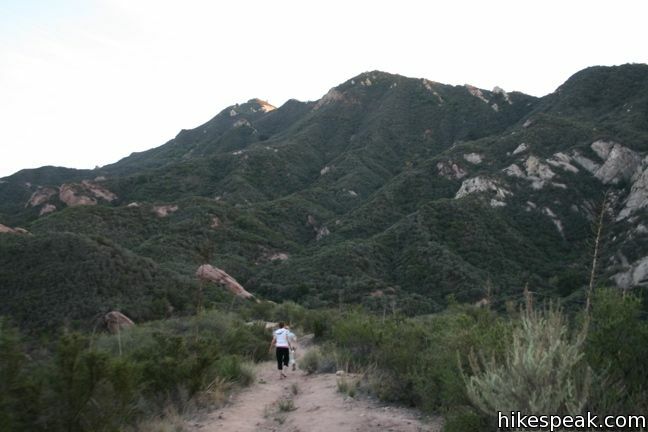 The junction is 1.1 miles from the summit of Calabasas Peak and 0.7 miles from Stunt Road. 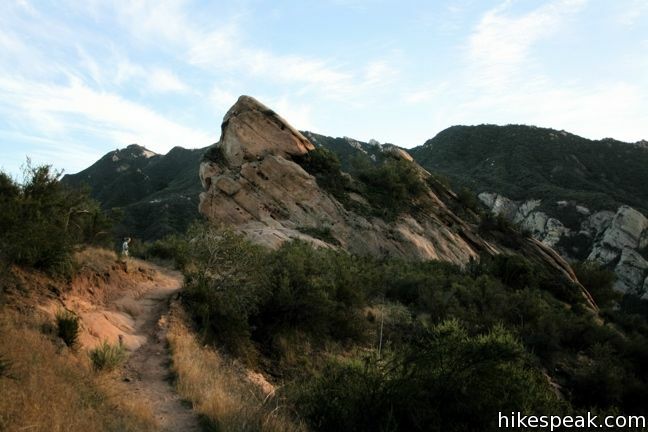 The total distance from the Red Rocks Trailhead to Calabasas Peak is 2.3 miles, and it is 1.9 miles from the Red Rocks Trailhead to Stunt Road. A third of a mile from the trailhead along Red Rock Motorway is a tall sandstone formation on the left that begs to be explored (and should be). 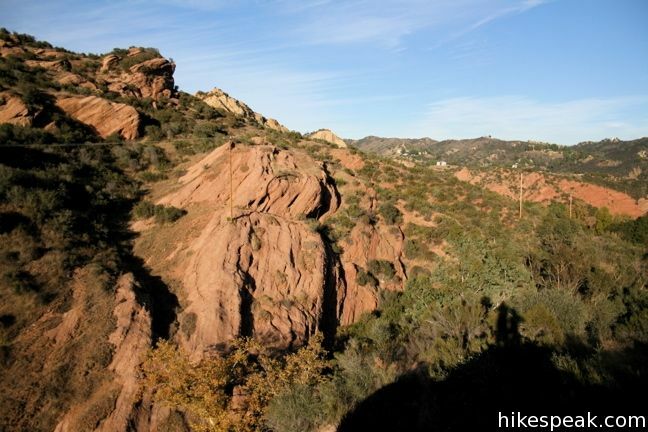 Climb above the small caves to gain a sweeping view of Red Rock Canyon. Not far beyond the caves comes a junction with the Overlook Trail. 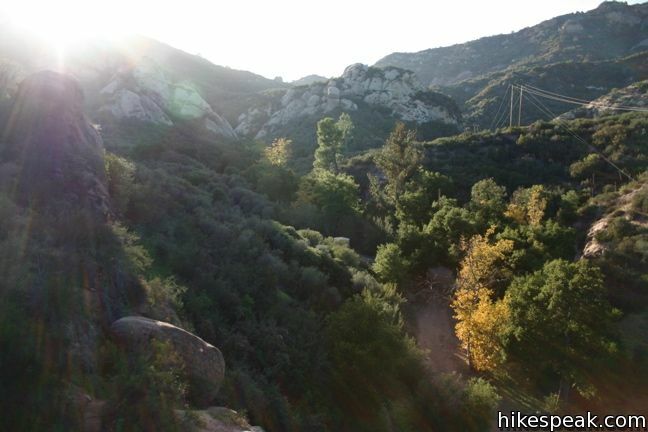 This unmarked single track breaks off to the right and climbs 325 feet over 3/4 of a mile to more outstanding Red Rock views. Those looking to break off trail and do some bouldering, will find good opportunities along the way. Red Rocks Canyon is an enchanting spot. The drive into the park makes you feel as though you are entering a remote and rustic location, even if you are only miles from the 101. Leashed dogs and bicycles are permitted. Bathrooms and a picnic area are at the trailhead. 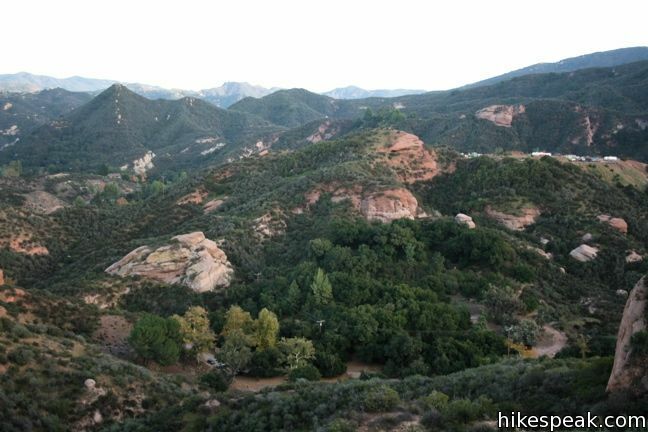 To get to the trailhead: Take the Valley Circle Drive/Topanga Canyon Blvd. exit off the 101, and head south on Mulholland Drive. Turn right on Valmar Road which becomes Old Topanga Canyon Road. Turn right when the road comes to an end on Mulholland Highway Road. 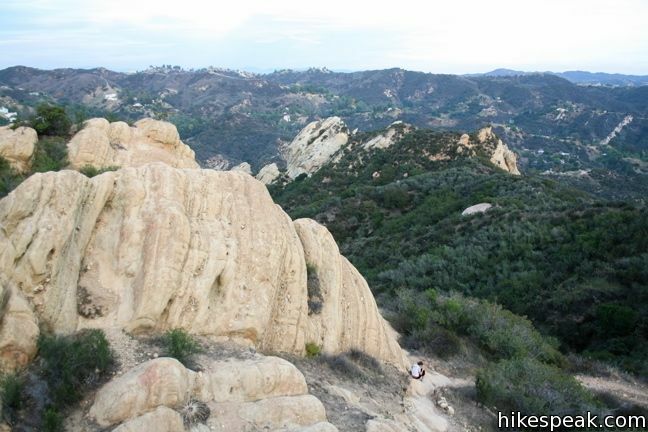 After a short distance, turn left to get back on Old Topanga Canyon Road. Stay on this road as it weaves through canyon neighborhoods, and turn right on to Red Rock Road. Stay on Red Rock Road as it becomes narrow and unpaved. Continue past all of the “no parking” and “no trespassing” signs until the road ends at the park. 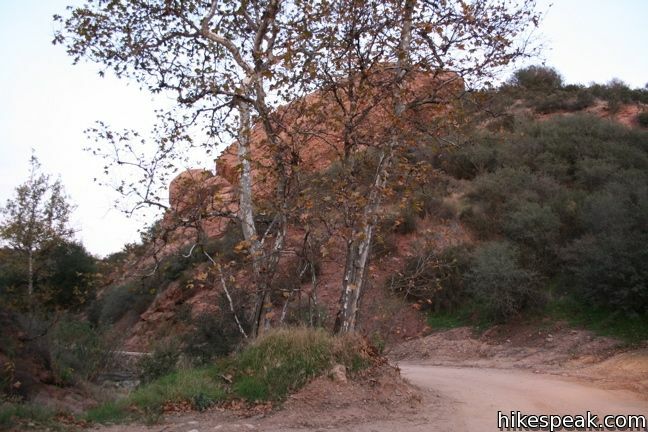 For directions to the Stunt Road trailhead, review Calabasas Peak. Great Hike. 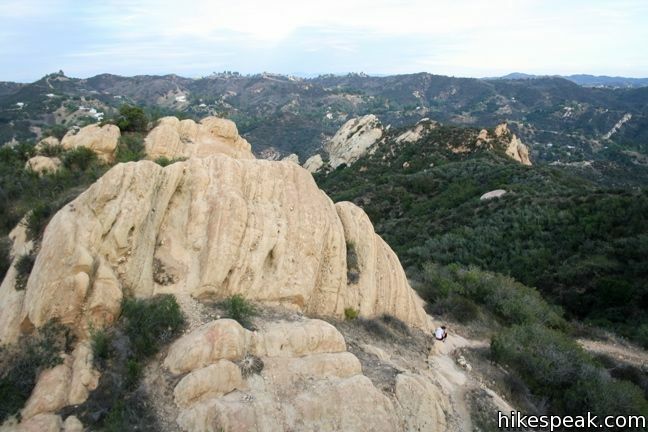 If you’re looking for a great L.A. experience without the buzz this is the place for you. We were there the first week of Jan 2012, mid 70’s and just saw one other hiking party (2). 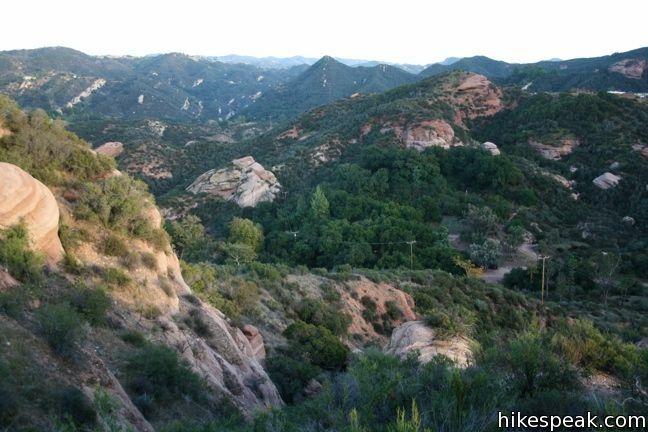 The views are spectacular with a variety of vistas, sand stone formations (climbing), foliage, and caves. A short stunning ride out of the area brings you to Malibu and the Pacific. Already planning to go back there next time in L.A. If you leave your camera you’ll be sorry. Hi. Thanks for sharing this hike. We just hiked during the rainy weekend so there was no on there, but and the skies cleared up before our hike! 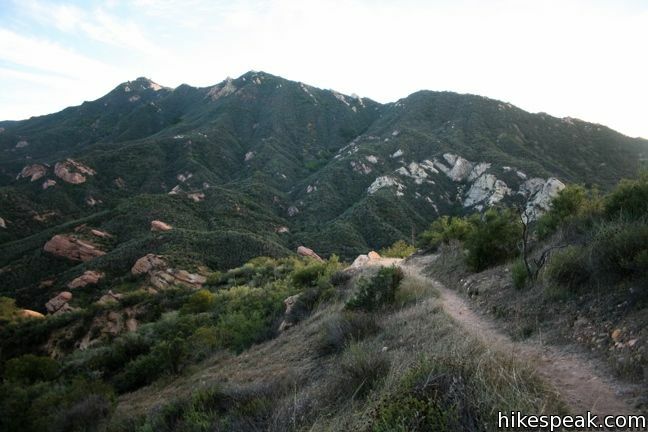 We did the overlook trail and trail towards Calabasas Peak, but couldn’t make it all the way with our newborn. We will return to do the whole hike. 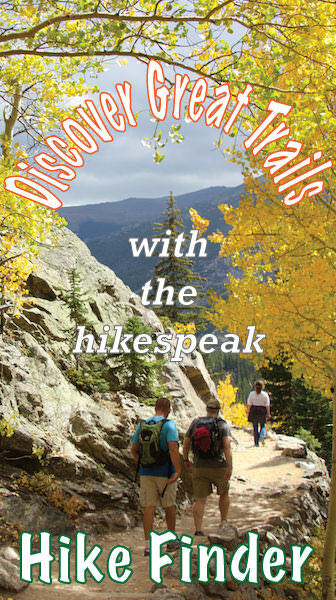 Thanks again for sharing these dog friendly hikes! This was one of our favorites. Red Rock Canyon is absolutely beautiful! I saw a couple other people while I was out there, but the views and rocks are stunning and there’s some great shaded areas and meditation spots (if you’re into that kind of thing.) Really lovely hiking trail. It is such a treat seeing Red Rock Cyn being preserved. When I was a kid (I grew up in Topanga) this was a Boy Scout Camp, Camp Slauson. My troop had a cabin there where we had our weekly meetings. We also spent many weekends there although it played host to many kids from the city on weekends and we rather liked having the place to ourselves. I think I’ve walked almost every square inch of the place. The photos here bring back many memories. Many thanks for preserving this treasure.